The Anaheim Ducks, having won five consecutive Pacific Division titles before this season, have been a top contender for awhile. This season’s somewhat slow start was logically attributable to a slew of injuries that befell stars and other key players like Ryan Kesler, Hampus Lindholm, the since-traded Sami Vatanen, Cam Fowler, Ryan Getzlaf, Corey Perry, Ondrej Kase, and Patrick Eaves. Now, with the exception of Eaves, whose well-being in the face of Guillain–Barré syndrome is priority number one before he resumes his NHL career, the Ducks are mostly healthy. Yet they still have not been able to gain enough traction to put themselves in a more secure position to this point. 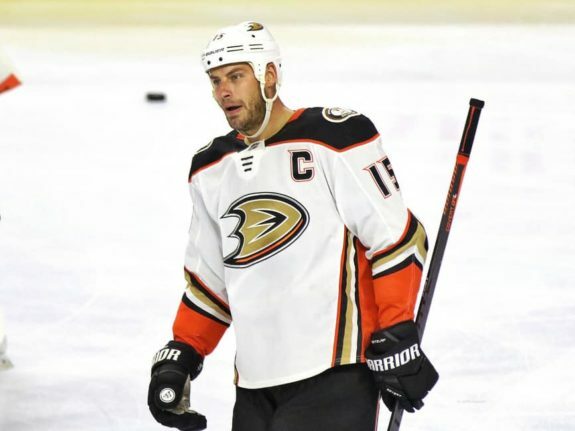 With the trade deadline looming, the assumption would be for the Ducks to look at possible moves to strengthen their shot at a playoff berth and their ability to make a run in the postseason. General manager Bob Murray, however, is not convinced that this is the right course of action. He would apparently rather stand pat. His opinion obviously matters more than anyone else’s in terms of what will actually happen, but is inaction really the right way to go for Anaheim? “We’re not the only team in this situation. There’s a whole bunch of us that are, as I call it, stuck in the middle of nowhere. We’re not in. We’re not out. We’re just there. I can’t see, unless something drastic happens in the next two weeks or they play a lot better than we’ve been playing, I don’t see much happening. It’s not as if it’s one of these teams where I feel like, last year when we went out and got (Patrick) Eaves, where I had lots of confidence. I’m still kind of waiting for them to show me something and they’re not. We’re very inconsistent. We’re very up and down. So far when it’s come to real, critical big games — we’ve basically s*** the bed in the big games. Right now I sit and watch. I’m not really talking to anybody, not really doing anything.” (from ‘Trade deadline chat: Ducks GM Bob Murray not inspired to make a move because of team’s poor play’, The Athletic, 2/14/18). Scathing as his comments might be, Murray isn’t wrong about the Ducks’ uneven play. Their pedestrian 29-20-11 record is congruent with how they’ve played. A good game here, a bad one there. A great period here, like the opening frame against the San Jose Sharks on Feb. 11, is too often followed by lackluster efforts in the other periods—see the final 45 minutes of that crushing overtime loss to the Sharks. There are numerous reasons why Anaheim has underwhelmed this season, but a deep dive on that can wait. For now, the question is: should the Ducks really do nothing before the Feb. 26 trade deadline? At the time of Murray’s comments, the Ducks were indeed out of a playoff spot. Through the weekend’s action, though, they’ve made it back—albeit tenuously—to the No. 3 seed in the Pacific Division, which would get them in. The point is, they are right there on the fringe, and despite their poor play, no one in the Western Conference wants to have to face a talented, veteran team that has the ability to turn it on for a playoff run. Beyond that, the Ducks’ team composition underscores the need to go for it. Ryan Getzlaf, while still going strong, is 32. His longtime partner in crime, Corey Perry, is also 32 and has not bounced back to stardom from last year’s low scoring output (by his standards) to the degree that the numbers suggested he might. A clearly hobbled Ryan Kesler is 33. Head coach Randy Carlyle has often leaned too heavily on wilting veterans Kevin Bieksa (36) and Francois Beauchemin (37). 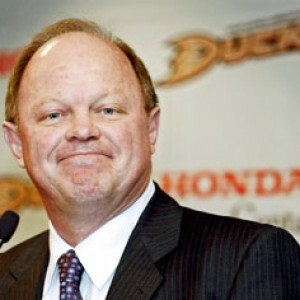 In that conversation with Custance, Murray suggested that the Ducks might have “too many holes” to plug up via trades. Given their position in the standings, however, wouldn’t a scoring winger and/or a solid defender go a long way towards making this a very dangerous club down the stretch? Doesn’t it make sense to go for it while the production from veteran stars is still decent, even if lessened? Anaheim really isn’t that far off from being a contender again. Perhaps an even more compelling reason for taking action is to avoid, as Murray himself called it, being stuck in the middle of nowhere. As a bubble playoff team, the Ducks are very much at a crossroads in that they need to pick a direction: try to win now or sacrifice the present to focus on the future. With several years remaining on the pricey contracts of Getzlaf, Perry, and Kesler, Anaheim seems ill-equipped to sacrifice the present, if for no other reason than those nearly immovable contracts to still-solid players who will likely not let the team completely bottom out in the next few years. Between that and raises/decisions due during that time frame with respect to Henrique, Kase, John Gibson, Jakob Silfverberg, and Nick Ritchie among others, Anaheim is more positioned to buy now. Of course, that’s easier said than done. It’s a careful balancing act between buying now and not depleting the organization of future assets, as Murray pointed out Saturday. “If we felt that we have the chance to run at it, you can do it,” Murray said. “Again, you give up a first last year. You give up another. You can’t just do that every year. Eventually the cupboard goes bare and that happened to us years ago. On the flip side, the Ducks’ prospect pool, while not elite, is decent enough whereby they could likely form reasonably attractive trade packages for helpful, second-tier players without including Sam Steel, Jacob Larsson, or a first-round pick. It will be a tricky line for Murray to walk, but taking a calculated gamble would, at this point, be preferable to doing nothing. If the Ducks do nothing, they will in all likelihood remain in the middle—not good enough to win it all today and not bad enough to obtain a high draft position that would aid in stockpiling elite young talent for tomorrow. 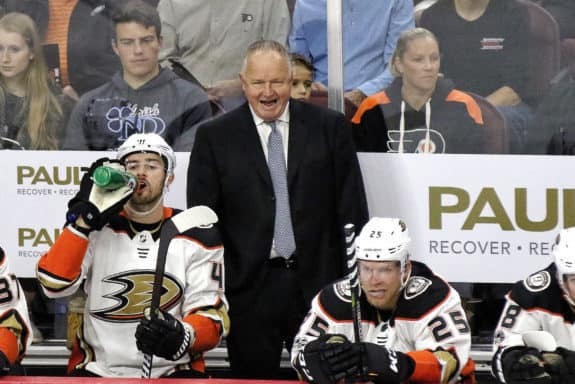 Murray understandably is not thrilled with what he’s seen in 2017-18, but inaction at the deadline will only get him where he and the Ducks have unhappily been for much of this season: nowhere.